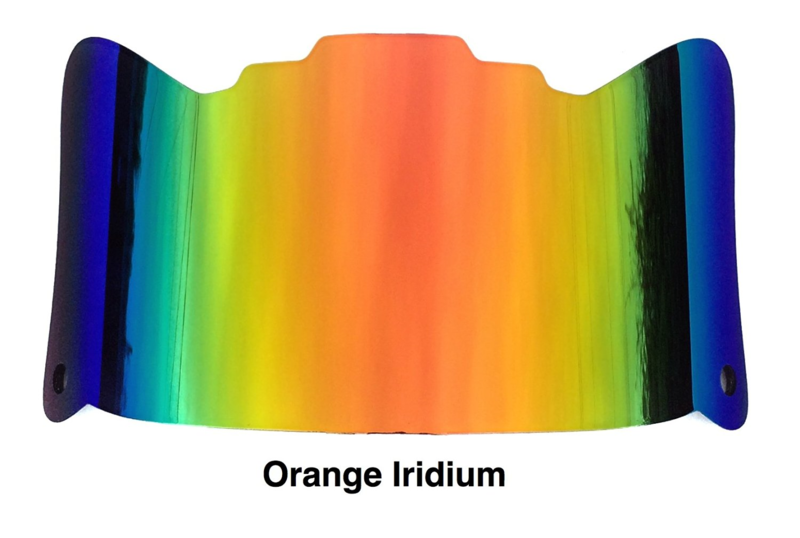 Do you want to protect your ribs and sternum from sudden impact injuries when playing football? In this article, I will walk you through the best football rib protectors in my opinion that you can buy today to give you excellent protection and increase your confidence everytime you step on the field. To start us off is an amazing protector coming from McDavid showcasing a Hex Pad protection which does a wonderful job of protecting a player’s sternum. 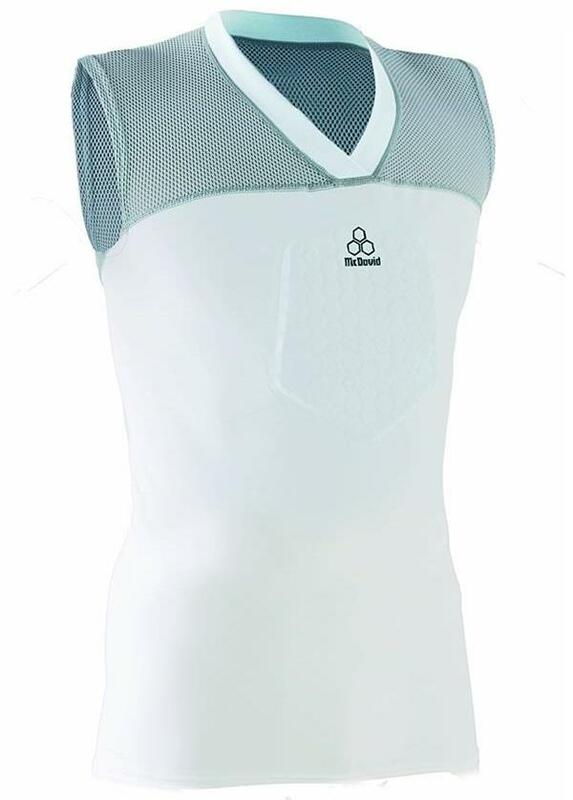 All assurance can be given that with this compression vest from McDavids, your chest is well protected against all impact and vital organs such as the heart are also protected in addition to the entire body. A wonderful feature of this shirt is the HYdravent Moisture technology that helps in controlling the body temperature of a player. 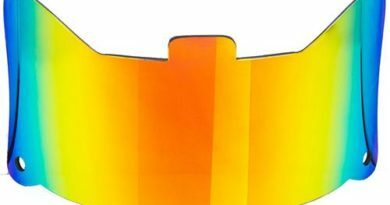 This will therefore be great in its ability to keep the wearer cool and comfortable without interfering with his performance. The design of Hexpad is such that it has a conformity and the ability to also stretch with the player’s body for protection is continuous for the area of the ribs through all the phases. On top of that, the Hexmesh design gives allowance for maximum flow of air to all the key areas of the body. This is a good option to heart guard gear that is bulky. Very breathable due to its design of fabric. Great in supporting muscle for reducing fatigue. It has a slightly smaller size and you need to pick the larger before you purchase. 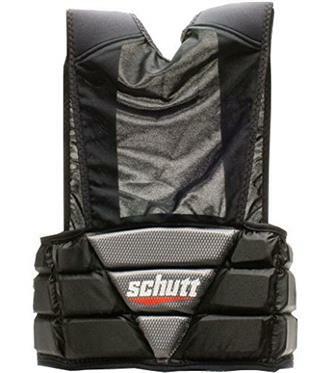 Coming in second is the Schutt Sports Youth Rib Protector that does a marvelous job in protecting a youth player’s ribs, liver as well as the kidneys. The wraparound gives it the ability offering all round protection to the wearer. This product has been built out of EVA material of high density. This is a very strong, durable and breathable type of material. With the kind of fabric used to make this product, the player is accorded all comfort possible by such an accessory. 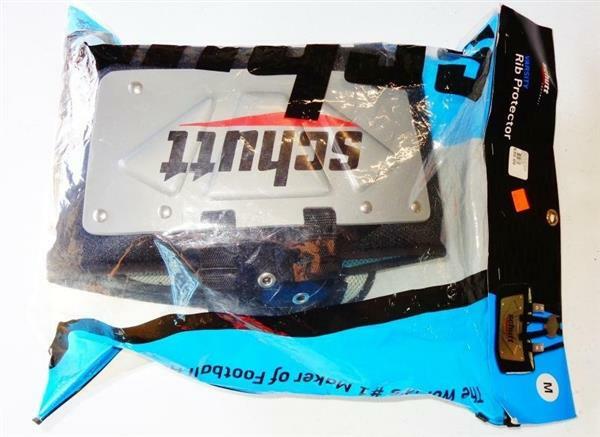 This piece of equipment can get attached to the shoulder pad or it can also work by itself. The awesome thing about it is that it arrives with a harness if a person wishes to use it by itself. For extra protection, it’s very advisable attaching it onto the shoulder pads. This gives the player allowance of moving more naturally by giving them the feeling of wearing just a single accessory beneath the jersey. This protector is available in a variety of sizes giving a person the ability to find one that is snugly fitting as possible. A person should ensure to find the right size for themselves as a smaller size can be uncomfortable wearing while a larger size minimizes the amount of protection obtained from the accessory. Built out of very strong, breathable and durable material. Offers the wearer amazing protection. Easily attaches itself to a majority of shoulder pads very well. Can be obtained in a variety of sizes. Has the ability to protect the player from all sides. Can be used without the shoulder pads. 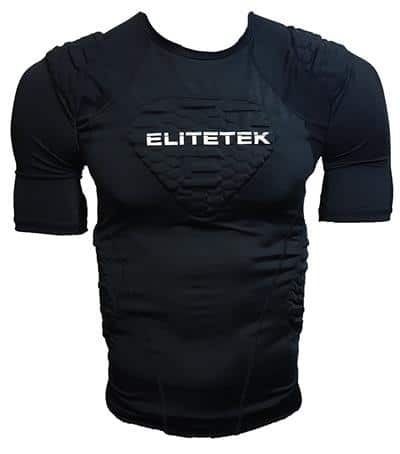 The EliteTek Padded Compression Shirt is an ideal football rib protector shirt providing extra support and padding to the areas of the ribs, chest as well as shoulders. It has a breathable mesh which allows fresh flow of air in the armpit region. This brand arrives having single pad composition that increases the strength and flexibility of this accessory. The enhanced positions for the pads are well thought and designed to give the wearer better mobility. It’s worth noting that this shirt was designed by coaches and football players. It has undergone several tests on the fields as well as in real football games. It has been ascertained by both the players and coaches. It’s that type of shirt the player will feel protected in as well as adding extra confidence to him. Extremely good for protecting the upper body. It is a very comfort shirt. It comes in the neon green and black color. Here is another great protector which does a good job in fitting snugly and maintaining points of comfort regardless of the fact that its core purpose is in absorbing and dissipating the force of impacts. As you will find out after you purchase, the straps are one feature that you will love about this accessory. 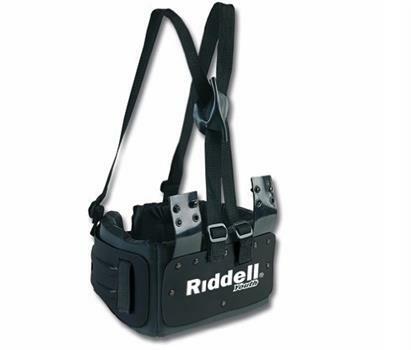 The straps coming with the Riddell Youth Rib Protector can be adjusted which means that the wearer is able to adjust them according to his height and torso. This ensures that it’s placed just where it needs to be. 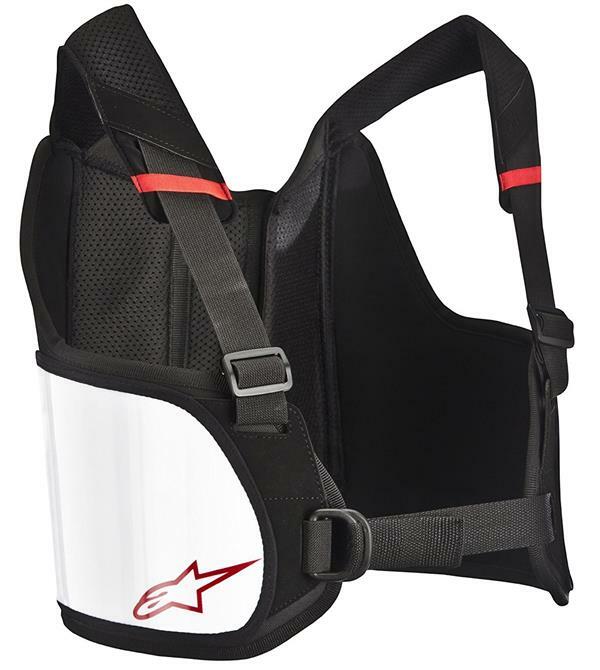 These straps do also have points of attachment so that it’s possible wearing the protector both low as well as high. One of the things that surely put players off is the fact that this protector’s use is meant to be combined with a shoulder pad. That being said, it’s easy attaching it to a majority of shoulder pads. Another feature of this product is that its outside is made of open cell foam which is good material for protecting the player’s ribs, kidneys and liver from the force of impact. A point worth considering is the little bit bulkiness to this accessory and you might find that it doesn’t fit well underneath some jerseys. This becomes even worse when combined with a shoulder pad. But despite this shortcoming, this product does a really good job of protecting the player from impacts. It comes with adjustable straps. It has points of attachment so that it can be worn both low and high. It is snugly fitting and is very comfortable. It’s a little bit bulky. This is one of those rib protectors that has been designed to protect the ribs of the player against the force arising from impact. 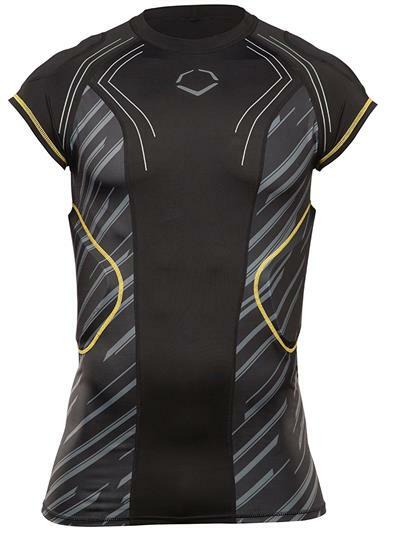 This shirt really stands out from all others in the market largely due to the fitted Nancocell AC performance pads as well as the GEL to Shell shields which maximize the mobility of the person whilst offering him protection. This protector has been designed with a type of fabric which is amazing is sweat wicking to help the body to be cool and comfortable in the moment of sweating. It’s available in a number of sizes which are able to fit anyone regardless of their age or size. A player should therefore ensure to buy one fitting them to allow movement more freely on the gridiron. It’s very effective in protecting the upper body. The sizes perfectly fit a person’s body. You need to fork out a little bit more to purchase. Schutt as a company has managed to stay on top of the game because it has continuously been able to produce products and accessories of high quality in all ranges of sports. The Schutt Varsity Rib Protector is one of the best protectors you can get out there and a very good reason exists as to why. This item has great quality. This is a well-made accessory attaching on to the shoulder pads with very easy removal. As a matter of fact, it is able to fit on a number of shoulder pads out there. It’s also able to be separately worn or get attached to a number of models of shoulder pads which has been quite appealing for a number to a number of players. Additionally, it arrives having an attachment harness. This is so that a player is able to attach it without having to look for extra harnesses. This product is available only in white but this is not a limitation as it has many sizes to it and really serves well. This fact that this protector’s is wraparound makes it one of the most amazing protectors all around. This means that the player is able to protect himself from all around including the back while giving him more confidence on the field. Can be removed with ease as it attaches to the shoulder pads. It protects a person from all sides with the back included. It is available in a number of sizes. It arrives with an attachment harness for itself. You can wear it with or without a shoulder pad. It’s available in only one colour. The Gear 200o Youth Rib Protector is one of the most incredible rib protectors ever designed for football. This accessory has been made by Gear which is a leading manufacturing company for tools and equipment of premium quality for sports activities. Furthermore, the material used to make this product guarantees light weight and best of all durability. This has made it gain a good reputation with satisfied customers who give it positive reviews. This is one of the most sought after sports products which is available in the market and coming at a great price. Foremost, this has been built out of a lightweight, high-performance guard that has been ergonomically constructed for the kidneys and the ribs. Furthermore, this accessory comes with an adjustable central back panel having Velcro attachments offering a complete range of fit that allows protection to be worn over or underneath the garment. Finally, the Alpine rib protector uses front straps that are fully adjustable having a D-ring type of closure. 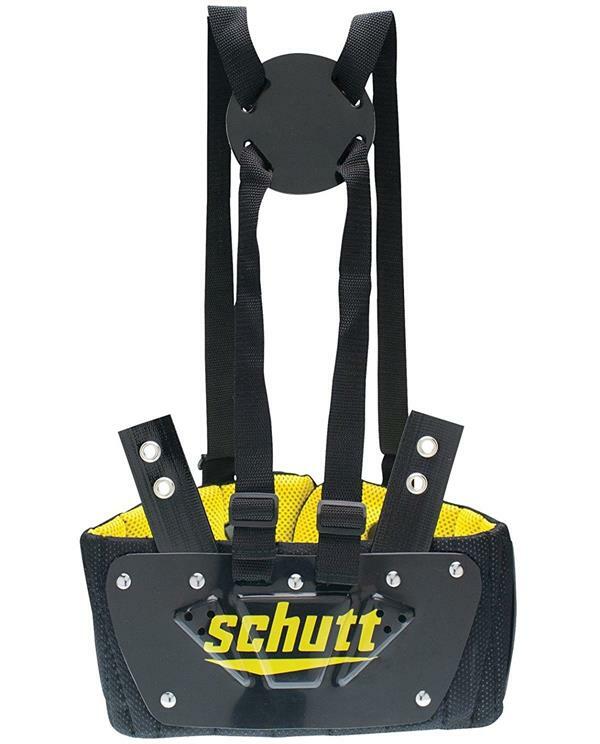 This is a well-made rib protector just like all other products coming from Schutt. An incredible and noticeable feature of this sports accessory is its padding. Schutt made the padding from foam with the ability to absorb all force from impact for the safety of the player in the game. It does a wonderful job of keeping the ribs protected in addition to the lower back. If you are anticipating for a lot of hits on the top back, you then will be forced to look for a back protector. This product is also very well ventilated and players can wear it for long periods of time without feeling the heat, this has been very appealing to most players. 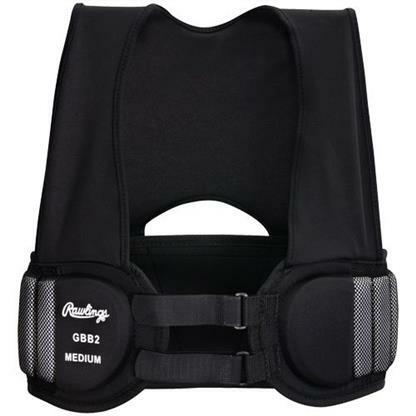 The fact that it’s not adjustable is one of this great rib protector’s short comings. There aren’t any straps available to make this become possible. A person also needs to be very careful as they select the size so as not to get one that doesn’t fit as supposed to. The fact that it also arrives only in a single colour is also another drawback but it’s not much of an issue as this is usually worn underneath the jersey. It’s lightweight and can thus be worn for longer periods of play. It’s doesn’t come having straps and there is no way of adjusting it and so a person needs to be very careful as they select the size. This is one of the few rib protectors with a good reputation with customers and has been ranked as one of the most decent football rib protectors. The positive reviews it receives from customers has largely been due to it great features. One of this is the specially made closed cell foam type of padding that’s of high intensity. This accessory has furthermore been designed using load spreaders of polyethylene which give it a snug fit when a player wears it. 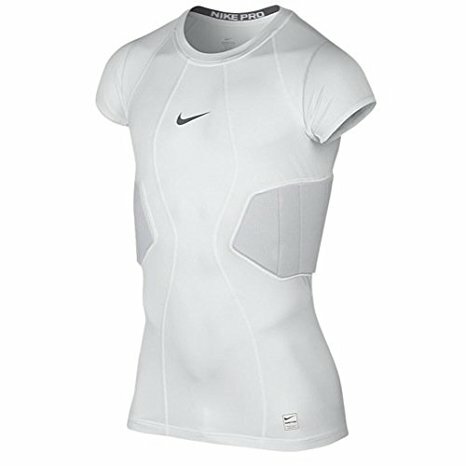 This a great 2 pad integrated type of compression shirt from Nike offering quality protection to the ribs of a player. The dry material used for compression goes a long way to provide the wearer with a tight but flexible fit having quality sweat-wicking capabilities. This is a high-end quality of fabric but as you will realize the pads are a little bit thinner to make a huge difference. 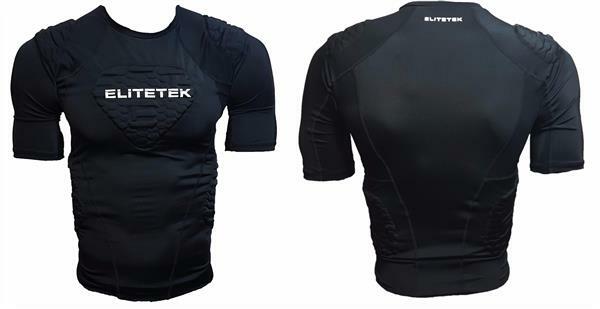 The main point in having rib pads that are thinner in conjunction with a compression shirt is so as to come up with something that can absorb impact in addition to sweat. This has also been tailored so as not to add any extra weight to the player. The material for compression works great in moisture absorption keeping the player dry throughout the game. The pads are a bit thinner and can’t provide protection that is thorough. Douglas has been known to make quality products for football such as neck rolls. 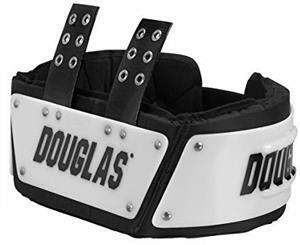 First and foremost this Douglas rib protector is wraparound meaning that the whole of the torso areas is covered with a padding of foam behind hard plates made out of plastic to give the player an ability of taking in the hits without as much pain as when you have no equipment. The loop holes that are provided also give the wearer plenty of room for adjusting how low or high the protector can be able to sit and this makes it very easy adjusting the rib protector to suit your needs. Has attachment loops that are adjustable for more options. The soft pads in conjunction with the hard plastic is quite a solid form of protection. No harness is available it’s limited to loop holes found on the straps. They only fit well on shoulder pads made from Douglas. Consider the ease of wearing and product usage, they both must be easy for you. The item needs to have proof of durability. It must contain unique features to make it stand out from the rest. While playing on the gridiron, the player should not feel overloaded but should at the same time be protected. This ensures that they are active during the game. Rib protector usage is mandatory to every player as it gives assurance of remaining safe when playing. In any sport that is physically demanding like football, players need to put in a lot in protecting the essentials of their bodies. Wearing standard playing equipment for football sometimes does leave a number of vital body parts exposed and if a player wishes to protect these parts of his body, the player needs to buy the right accessories to do so. When playing a sport which involves instances of high impact such as football, it’s only logical for every player to take the time to equip himself with the right kind of items in preparation to get physical. One such accessory is the rib protector which is very crucial in reducing the chances of having wind knocked out of a player as it’s honestly dreaded by all players alike. 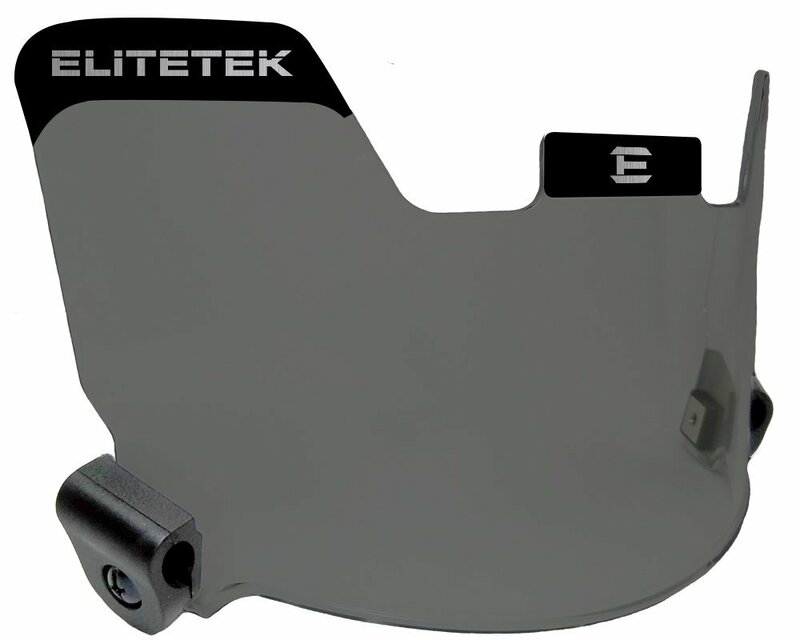 In elaborating the concept of the rib protector in terms that are more definitive, this is an optional piece of football equipment attached to a player’s shoulder pads. In other words, it’s not an inclusion in the standard set of accessories for football. While no “right” way of attaching the rib protector exists, wearers usually make use of screws or bolts in holding accessories like the neck roll and in our case the rib protector. 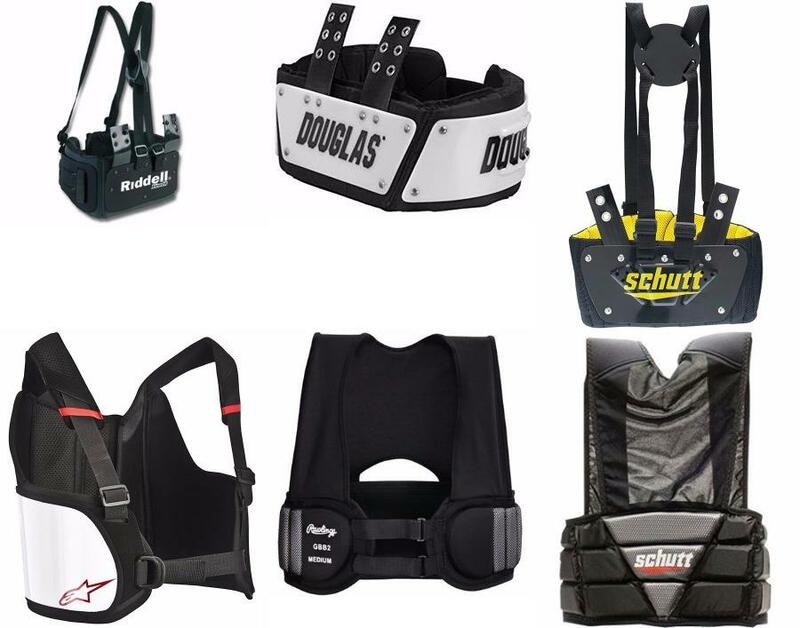 You sometimes may come across a number of brands which offer the wearer a harness for wear as opposed to attaching the accessory using bolts or screws manually. But then again a player needs to put it in mind that wearing a harness might honestly not be as secure as when the item is physically attached using metal tools. Click on image to see more! When the issue of protecting a player’s ribs comes up, there is the padded compression vest or shirt, and then there is the traditional rib protector. The padded compression vest is made up of compression material as well as padding that has been integrated in the ribcage area. 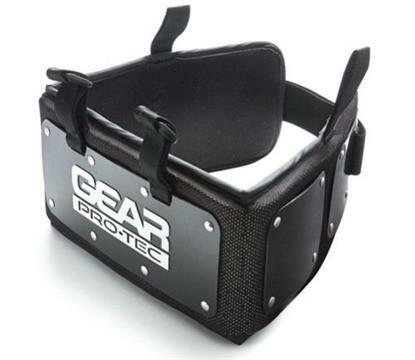 The typical (traditional) protectors usually have straps, a harness, or both so that the player can properly apply the accessory to their football equipment. 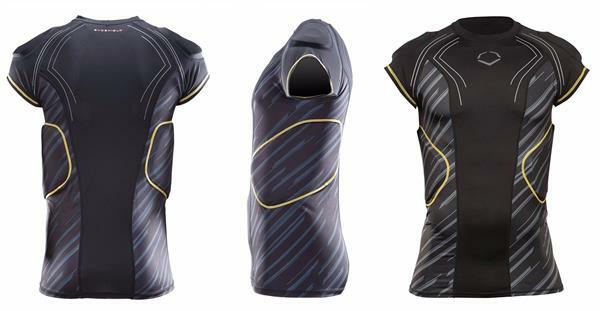 Occasionally, the compression vests might also contain integrated pads for the shoulder tops as well which supplies additional padding under the shoulder pads. Which is the best rib protector for you? Well, this does depend on what you want in this piece of equipment. 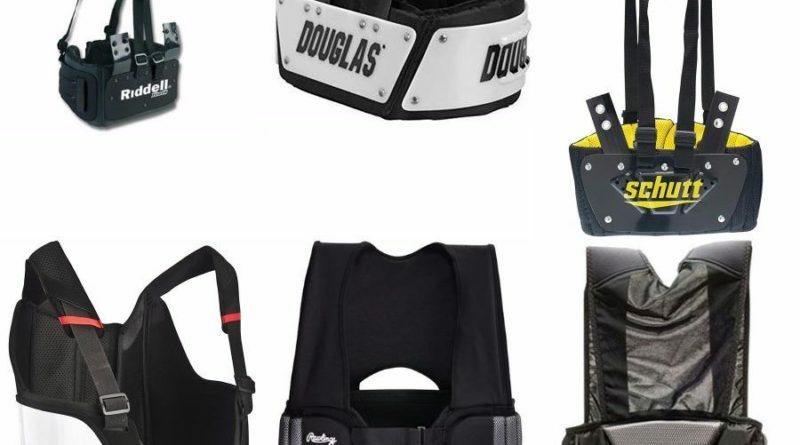 If all that you want is just additional padding all over the upper body, then compression vest having integrated padding will certainly assure you of security. But if what you are looking for is something which has some bulk onto it, traditional rib protectors don’t hurt. Whilst hitting two birds with one stone by acquiring a compression vest that is comfortable, you can’t rely on its padding as that what can expect with the traditional material. For skill players especially the quarterback, donning a rib protector is very crucial. The reason to this is because players most likely to get tackled are those having the ball in their hands and so leaving the ribs out of your protection plan has the potential of leading to an injury after being hard hit on the right spot. As you might be knowing, skill players (Quarterback, Tight End, Defensive back, Wide Receiver, Running back, etc.) have the tendency of being thinner as compared to linebackers and linemen. With little fat on their bodies, they have a susceptible rib cage to injuries such as broken/bruised ribs or even a punctured lung. While the rib protectors prove to be very useful for skill players especially, it’s not a bad decision to wear one even if you don’t usually touch the ball. It’s not rare seeing defensive backs and line backers who are wearing rib protectors. They after all do get into the mix just like all the other positions. It’s granted that you can find exceptions but most linemen in overall have the tendency of straying away from using a rib protector. Whether your participation is in the adult or junior level, getting a rib protector shows that you really value your rib cage and the back. There is nobody with eyes on the back of their heads and a player will never know what’s rushing to blindside them. Using a compression vest that is padded or rib protector really helps players in shielding themselves away from potential injuries. Copyright © 2019 shocpro. All rights reserved.